A.W. Tozer’s The Knowledge of the Holy and J.I. Packer’s Knowing God have received (much deserved) wide popularity for faithfully bringing a countless number of Christians to a deeper understanding of God’s character and nature. However, both of these books only go so far; for Christians wanting the next level, where should one turn? 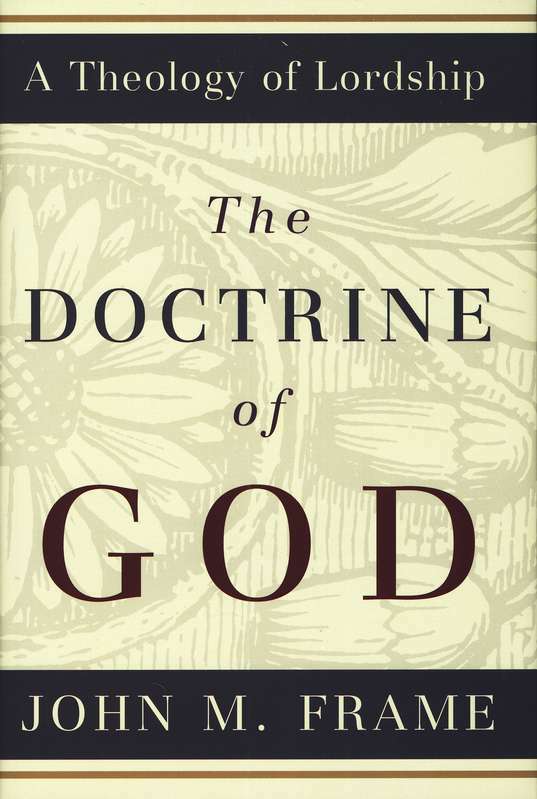 I submit John Frame’s The Doctrine of God, a book devoted to providing a deep foundation on what Scripture says about God. While this book is now just over 10 years old, I only discovered it last year. Others had patiently waited over 15 years for this book as the second part of a (now complete) four part series called A Theology of Lordship. Needless to say, for some this book was a long time coming. For many others though, John Frame and this series are probably unknown. This is unfortunate since this book contains a treasure trove of theology. Since this is such a large and dense book (at 896 pages), I will give a longer summary for those who are interested in how Frame puts this all together. If you are only interested in my response, feel free to skim past the summary. After a brief introduction, Frame establishes his framework (unintentional pun) for approaching the doctrine of God – Lordship. Frame shows that God reveals Himself primarily as ‘Lord’, and that this title is central to Scripture. It reveals that God is a Person (25), that He is holy and unique (27), and it also implies a relationship (30). Before delving into the expanded Lordship attributes in more detail, Frame covers some related areas in the next two parts. Part two has two chapters devoted to the ‘problem areas’ of human freedom and the problem of evil. Both subjects are addressed in extensive detail, covering and critiquing the most popular ‘answers’ before Frame presents his own. It’s particularly here that Frame’s Reformed theology is made plain; he rejects libertarian freedom and presents an alternative understanding of human freedom that shares much in common with other Calvinistic theologians. In Part three Frame discusses the philosophical issues that are more commonly addressed in prolegomena (introduction). However, he believes that philosophical discussion must start with Scriptural foundations. Frame’s Theology of Lordship is then applied to the philosophical areas of ethics, epistemology and metaphysics. Parts four through six continue Frame’s unpacking of the Lordship attributes. He addresses actions, descriptions and the Trinity respectively. God’s actions, such as creation, providence, and miracles are extensively discussed. For example, in the subject of creation Frame covers issues such as God’s relationship to creation, creation out of nothing, whether the seven days of creation were 24-hour days (he sees no reason to doubt that they were), the age of the earth, and evolution. With each of these issues, tradition, theology, and Scripture are all brought to bear, with Scripture having the loudest voice and final vote. Part five is a large section covering descriptions of God. Frame sees all Biblical description of God fitting in a triad: titles, images and attributes. Frame spends the most time on God’s attributes because they are the more controversial and difficult, though he believes God’s titles and images are generally overlooked. Interestingly, instead of using the standard categories of ‘communicable’ and ‘incommunicable’ attributes, Frame offers his own alternative – unsurprisingly, a triad! God’s attributes are put in the categories of goodness, knowledge, and power. The final section, Part six is about the Trinity. The Trinity is the deepest revelation of God that Scripture gives us. Frame follows the standard way of addressing the issue: God is presented as both one and three, with each Person being attributed as distinct and yet fully possessing deity. Lastly, there are a number of appendices containing reviews and interactions with other books on the subject. While I have read much theology, this is the first major work on the Doctrine of God (Theology Proper) that I have read, so I won’t be able to comment on how Frame’s compares to others. That said, I know of many who consider this as the book to get on the subject, so I think my high regard for it is warranted. Frame’s approach is unique: he begins with the tangible before moving to the intangible. This isn’t usual in theology, mostly due to the influence of philosophy on theological discussion. Philosophy tends to move from the abstract to the concrete, but Frame believes that most students today don’t have the background in philosophy to find such an approach useful. Instead, Frame flips the approach on its head by addressing the text of Scripture before philosophical questions, God’s actions before descriptions, and examining the Trinity last. Even within individual topics such as God’s actions, Frame begins with miracles and moves to creation last. His approach attempts to mirror the approach that we get from the Word; we experience God’s actions before receiving revelation. God acts so that we might know that He is Lord. Whether this approach and his triperspectivalism (see above) are more helpful than not is a matter of opinion. However, I did find his approach very refreshing and natural and am surprised if he is alone in this approach. Some will take issue with Frame leaving the Trinity until last. Frame anticipates this and argues that since God’s attributes, actions, and Trinitarian nature are all different perspectives of understanding the Person of God, they can be covered in any order. With Frame’s approach of concrete to abstract, it makes sense that the Trinity would come last. This is not to say that the Spirit’s deity and Christ’s are not mentioned until near the end of the book; they are constantly presupposed. My issue is not with so much with the order of addressing the Trinity, because I understand Frame’s approach and see the strengths of it. However, I still can’t help but feel that this book lacks a Trinitarian flavour that may have been more tangible if Frame had established the Trinity from the outset. I wonder if having the Trinity first would have resulted in any significant difference in other discussions, such as God’s attributes and actions? Frame’s writing style is surprisingly clear and even conversational. It’s very easy to read, considering the subject matter! Frame is able to make complex concepts understandable without oversimplifying them. However, a downside of this clarity is the fact that this book is 896 pages, and thereby intimidating for many the average reader. I can’t help but think that most of the appendices could have been removed – and not been missed too much – in order to help this book be more approachable. Due to the size and thorough nature of this book, I expect many will expect to use it as a reference. I have done so myself, and it has been very helpful. However, with Frame’s conversational, flowing style, it wouldn’t hurt to read this book more or less from beginning to end (as I originally did). It’s a quicker read than it sounds, it has large block quotations from Scripture, and it’s surprisingly devotional! On the other side of the coin, his conversational style may hinder this book’s usefulness as a reference. Most expect reference books to have data easily digestible, perhaps with lots of tables and lists. This book isn’t put together quite that way, but instead is full of engaging writing that can’t be taken in bite-sized chunks – which makes for such a good read. This book must be taken on its own terms. As to Frame’s thesis of God as Lord, I think it has much going for it. It is the most commonly given title to our God and it is the title that He most consistently chooses. I do wish that Frame had been clearer on the fact that God’s name YHWH, translated as LORD in our English Bibles, doesn’t actually mean ‘lord’, but is a proper name with a meaning closer to ‘to be’. He does address this, but it may leave some readers confused. However, the attributes of Lordship (control, authority, and presence) are all implied in God’s self-revelation of His name (Ex 3), so I don’t think Frame is wrong in using ‘LORD’ passages to support his assertion that God reveals Himself as Lord. One clear strength was Frame’s reliance upon Scripture rather than philosophy or popular theological concepts. Every discussion was continually brought back to the text and if it couldn’t be seen in the Bible, Frame didn’t have much time for it. I consider this a strength, though some may wish that he gave more space to theological and philosophical discussion (which he does do, don’t get me wrong!). Lastly, Frame’s Calvinist theology must be noted. Among non-Calvinists, some will find this more frustrating than others. Frame doesn’t go out of his way to ‘sound Calvinistic’; but with a topic such as God Himself, it’s impossible to cover areas such as God’s sovereignty and human responsibility without Frame laying his cards clearly on the table. On that note, his discussions of that topic is considered by many worth the price of the book alone, so if you want a good presentation of the Reformed understanding of freedom and evil, this is a great place to turn. Back to the point, he is very fair in his assessment and responses to Arminianism and other forms of non-Calvinism, but also has no fear of strongly criticizing them where he thinks they are wrong. On the other hand, his Calvinism doesn’t make itself known in every section and there are substantial sections with insights from which all Christians should be able happily receive. It would be a shame if more did not read this book simply because of some of his conclusions. I greatly enjoyed this book. The subject matter, content, approach and writing style all contributed to make this book surprisingly enjoyable given its size and scope. It’s difficult to review a large book such as this because the actual content has to be summarized to the extent that the real gems aren’t discussed as much as I would have liked. This book is full of great truths. The Doctrine of God would be a wonderful reference (though see my comments above) for any pastor or serious student to have on their shelf. It would also be a great book to read through beginning to end! Don’t be put off by the size; as mentioned already, Frame’s writing is very enjoyable and easy to follow. His unique approach and insistence on staying close to the Scripture makes this topic much easier to comprehend for those who would otherwise never pick up this kind of book. I sincerely hope that this (now ‘old’) book receives a much wider recognition, as I think it stands as a very unique and thoroughly-Biblical contribution on the Doctrine of God.